We provide Pipe Bursting and Ramming in NJ, PA (Bucks, Montgomery & Delaware County), Delaware (DE), Maryland (MD) and New York (NY). Pipe Ramming is a method of installing a steel pipe or casing using a pneumatic tool to hammer the pipe or casing into the ground. Pipe Ramming, like Horizontal Auger Boring, is extremely useful for the installation of larger pipes over shorter and shallower distances. Pipe Ramming can be used under existing roadways, railroads, and even in bodies of water. Pipe Ramming is an acceptable method for all ground conditions. At AmeriDrill, Inc. our team is highly specialized in Pipe Ramming for all soil conditions and guarantees to get the Pipe Ramming job done right the first time to save you time and money. Our Pipe Ramming services can be used in Pennsylvania (PA), New Jersey (NJ), Delaware (DE), Maryland (MD) and New York (NY). Pipe Bursting can be used to replace pipes without requiring open trench methods. Pipe Bursting is accomplished by pulling a bursting device through the existing pipe, shattering the old pipe and forcing the fragments into the surrounding soil. One of the advantages to using Pipe Bursting for your Pennsylvania (PA), New Jersey (NJ), Delaware (DE), Maryland (MD) and New York (NY) project is that Pipe Bursting allows for the opportunity to upsize the pipe rather than restrict the size of the pipe, along with minimizing roadway disruption. No NJ, PA, DE, MD or NY Pipe Ramming and Pipe Bursting job is too big or too small. We are experienced and trained in working with all types of terrain and challenging objects. 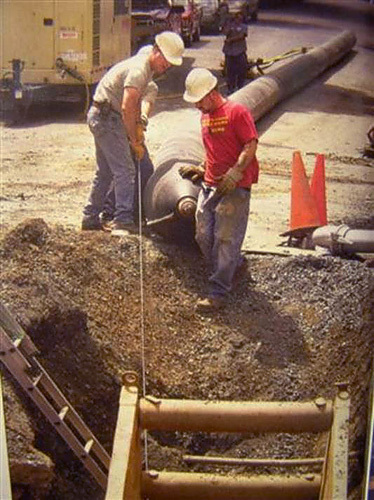 At AmeriDrill, Inc. we are extremely hands on with each Pipe Ramming and Pipe Bursting job we do. We are constantly surveying the area to make sure that the site is safe for you, the community and our workers. We value safety as much as you do, which is why we go above and beyond in making sure each Pipe Bursting and Pipe Ramming job is safely handled all the way through. Our quality of work and level of customer service is unmatched not only in NJ, PA, DE, MD and NY, but throughout the entire drilling industry. Contact us today to find out why AmeriDrill, Inc. is the right company for all of your Pipe Bursting and Pipe Ramming needs.